Lately, we’ve been feasting on oysters whenever possible (every other week). 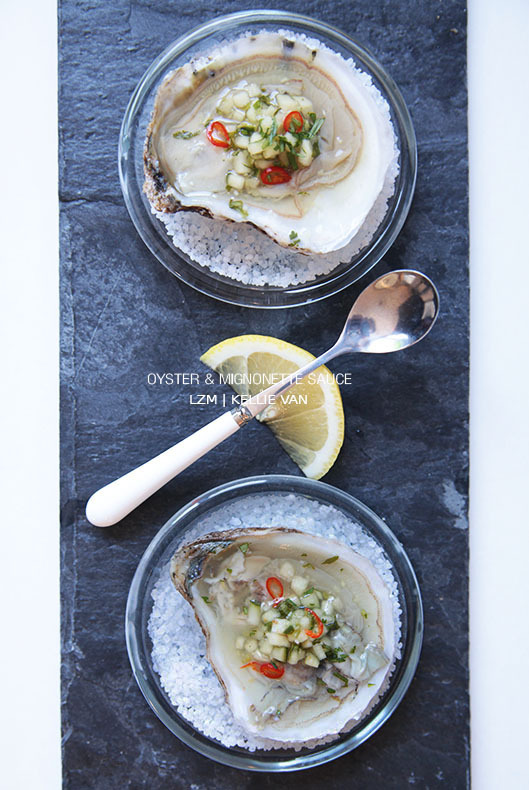 My husband makes a mignonette sauce to be paired with them and the combination is just mouthwatering. 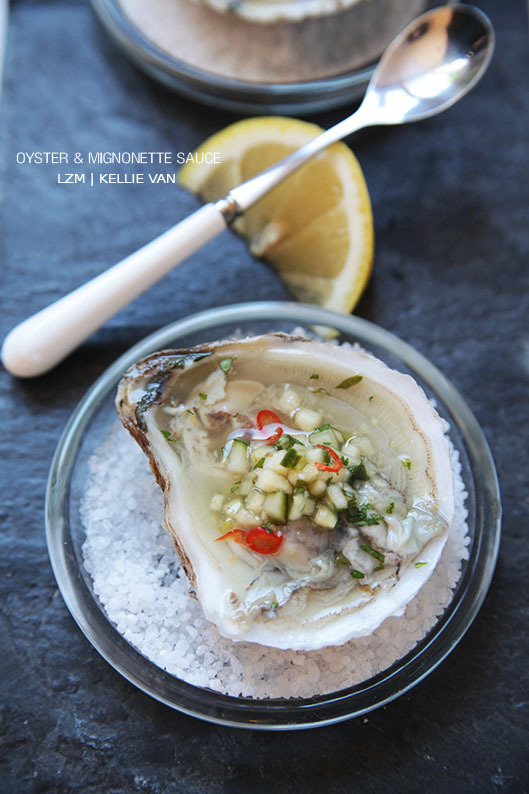 The mignonette sauce basically takes the place of a squeeze of lemon juice. It’s actually much better. There’s a basic mignonette sauce with main ingredients of vinegar and shallots. However, because I can’t stand the taste of uncooked shallots or any onions, the husband modified the sauce. I think his rendition is much better than the typical boring one! Recipe is fairly easy. Combine and whisk the following ingredients in a bowl. All measurements can be altered based on preference. Best if cooled in fridge prior to serving. Next time You & Mr. 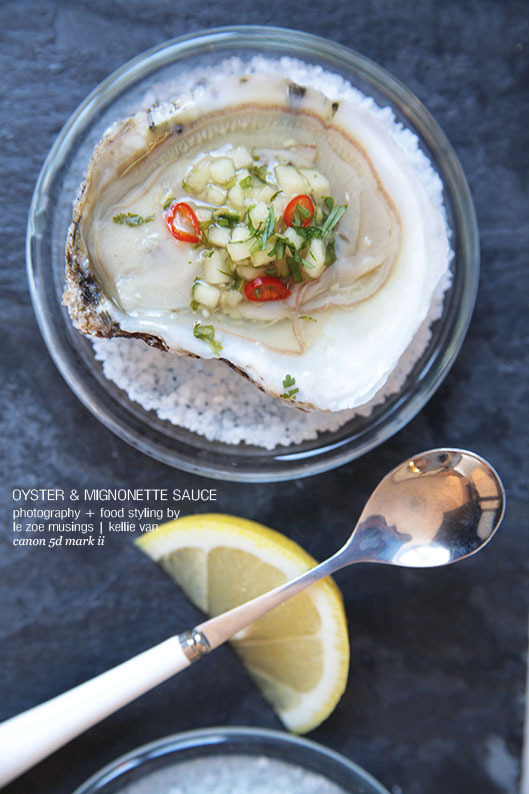 Oyster connect, brighten his day with some mignonette sauce. He’ll thank you for it! I just discovered the easiest mignonette ever: peach white balsamic vinegar. We used this kind: http://www.shopweolive.com/we-olive-collection-peach-white-balsamic-vinegar/ but I’m guessing any fruit-flavored white balsamic would be delicious. Just shuck, drizzle, and slurp! Mmmm! I’ve always wanted to learn how to make this! I Love oyster. I’m so jealous! You take EXCELLENT food pictures. Oh! What oysters are you eating? My partner and I are obsessed with oysters, recently on a trip to Boston we went to the Island Creek Oyster Bar, and had some delicious new varieties!!! Mmmmm… thanks for sharing! I LOVE oysters and that sounds amazing. You need to share some of your photography tricks, because your pics are amazing. Love your blog! Fabulous recipe and so easy! I usually take my raw oysters with a dab of cocktail sauce and a cracker, but this is so much classier and more glamorous. Photography is gorgeous, as aways! I’ve nominated you for an award!